If there is a single most amazing perfect breakfast treat, it’s a scone. Not too sweet, not too boring. It’s just right. 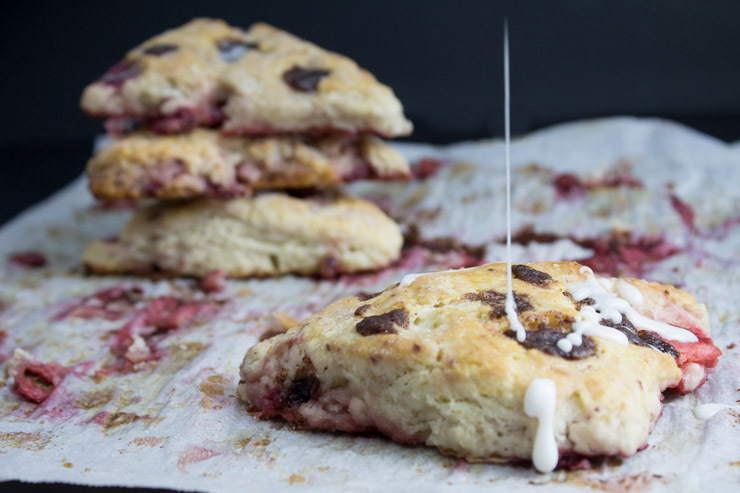 You can put just about anything in a scone and it will be delicious. 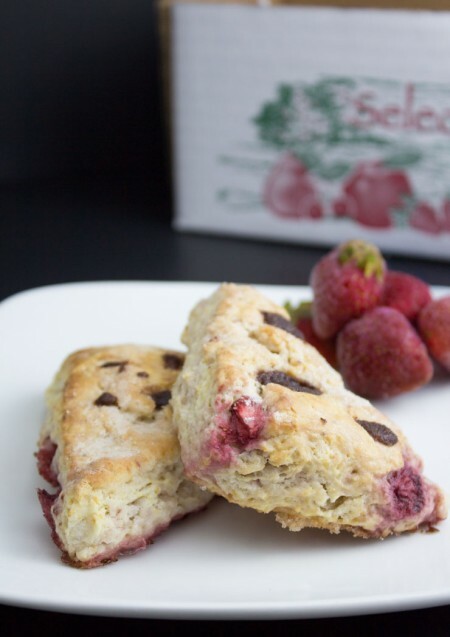 After picking some local strawberries recently, I decided to toss them into some dough and make what would become one of the best grab-and-go treats in my kitchen, Strawberry Cinnamon Chip Scones! 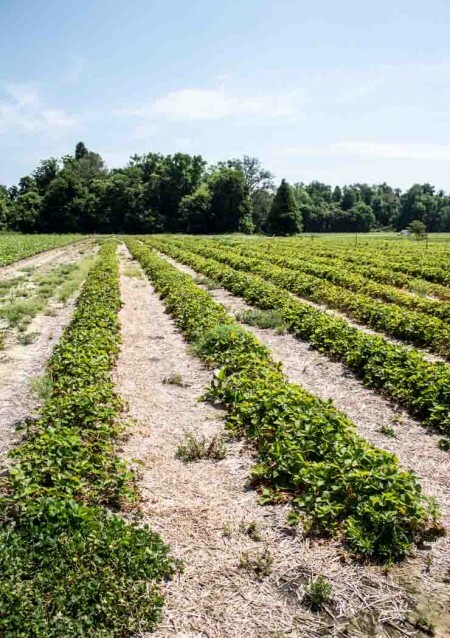 I was able to juuuust make the cut-off for strawberry picking this year at one of the local Kentucky berry farms. Who knew strawberry season ended so early? I’ll certainly remember that and start a bit earlier next year. 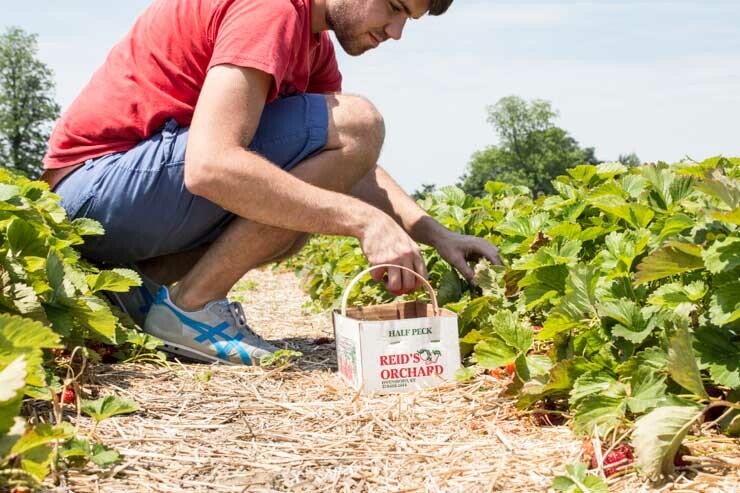 Even with it being near the end of the season, I was able to find pounds and pounds of perfect strawberries to stock up on. You can’t even have enough fresh local fruit, right? Strawberry jam, strawberries and whipped cream, strawberry pies… I’m basically the Bubba Gump of the strawberry world, y’all. I ended up with nearly 10 pounds of delicious strawberries. 10. Pounds. Thank goodness for freezers! Before freezing most of these, I kept a couple cups out for my scones. Well, one cup for scones. The other to eat while I was making the scones. After chopping up the berries, I made the dough. Scone dough is very sticky by nature. Warning.. Do. Not. Add. More. Flour. This is not a test. I repeat. Don’t add any more flour. A bit of flour on your hands and a bit on the board will be fine. The stickiness to the dough is critical to leaving that fluffy, sweet confection. Stick with me here. (har, har…) It’ll work out just fine. The cinnamon chips add a great taste profile to the scones. 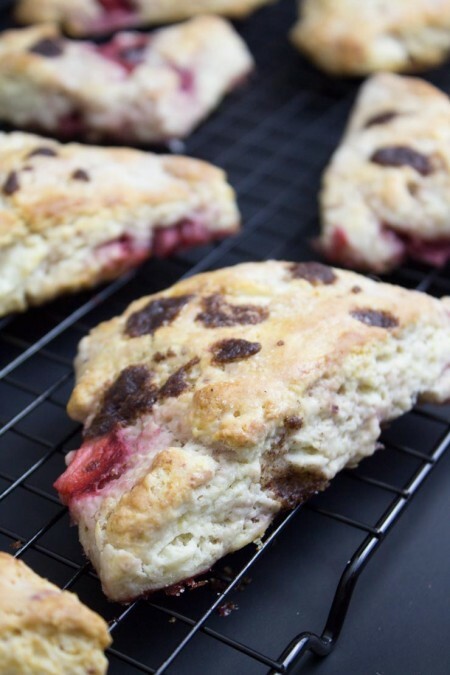 Simple strawberry scones are delicious by themselves, but adding bits of cinnamon to the mix really takes it to a different level. Who doesn’t like cinnamon and sugar? I also like to brush the tops with a bit of… you guessed it– butter. Sprinkle some raw or turbinado sugar on the tops to add a bit of extra pizazz. Wait for it… Wait for it… GLAZE ICING. Yes. I said it. Add a bit of glaze icing and these will be perfect! I made a double batch and threw half of them into the freezer (unbaked) so I could pop them out and into the oven for fresh, warm scones whenever I wanted them. So… every day, basically. Sift dry ingredients together in bowl. Cut in cold butter until coarse, pea-like texture. Keep very cold and work quickly. Mix in cream, lemon zest and combine. Fold in strawberries and cinnamon chips. Dough will be very sticky. Do not add any additional flour! 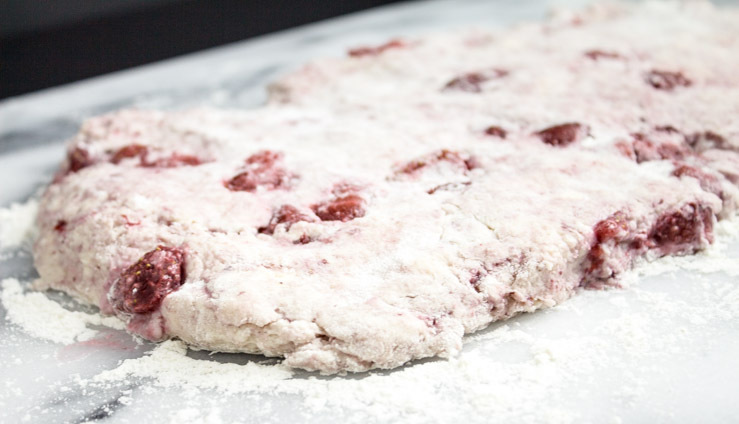 On a floured surface, press out dough to rectangular shape, about ½" thick. Cut out triangle with sharp knife. Place carefully on parchment covered baking sheet. Brush tops with melted butter and sprinkle with sugar. I prefer turbinado or raw sugar for this. Cool and enjoy! 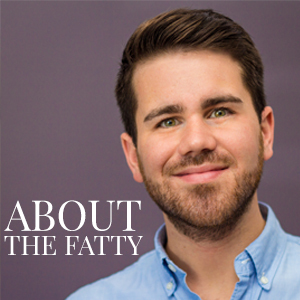 Visit SouthernFATTY.com for more. Enjoy! Be sure to let us know when you try these out. I don’t have cinnamon chips, so might just have to add in some cinnamon. Anything for scones! Love those scones with berries that you have made here. Perfect for breakfast or afternoon tea. I have been strawberry and peach crazy this summer. Nashville has had such a wealth of both. Thanks! It has been really great around here for fruit lately. I pinned because the boys will LOVE these? Are you going to the Thursday night thing? Thanks! I think I will. See ya there, hopefully. These look amazing, Phillip! Love the cinnamon too. Great pics! Appreciate it, Matt! I wasn’t sure about the cinnamon/strawberry combo, but it worked out pretty well. 100% agree on scones being perfect for breakfast! Love that you added cinnamon. I wouldn’t have thought of that combo, but I bet it’s awesome with those fresh strawberries! Perfect for anytime, really! The cinnamon accented the strawberries REALLY well. I was sorta surprised. It sounds a bit odd, but tastes great!